A SOPHISTICATED MERMAID LACE WEDDING GOWN WITH A SHEER V NECKLINE AND DETACHABLE BELT. BEAUTIFULLY EMBELLISHED LACE ADORNS THIS DRAMATIC FIT AND FLARE WEDDING GOWN WITH A LACE UP BACK FINISH AND ORGANZA SKIRT. 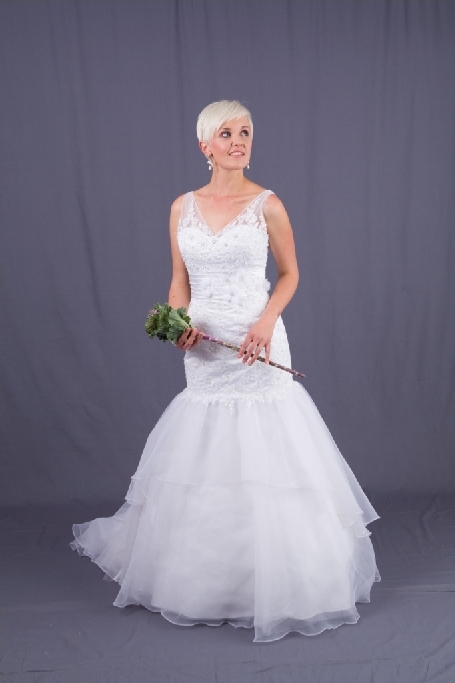 THIS WHITE WEDDING DRESS IS AVAILABLE AT YOURDAY BRIDAL IN SIZE 34. WEDDING DRESS APPOINTMENTS CAN BE MADE AT OUR STUDIO DIRECTIONS ON OUR WEB AT CONTACT US. CENTURION BRANCH CELL 073 299 2028 OR 012 653 0318,104 WILLEM BOTHA STREET ELDORAIGNE centurion@yourdaybridal.co.za CLOSE TO CENTURION MALL AND MALL@REDS.